The result of careful tinkering and lengthy discussion behind doors of a particular building along Buona Vista Road and yet another one in that quaint, little far-away Cambridge, ebbs and flows in the overarching ‘A’ Level curriculum go relatively unseen. For the average student already struggling to meet deadlines and complete assignments, but still looking to find out more about what this means for those daunting examinations in coming years, here’s a summary of the key changes you can expect, gleaned through an interview with five teachers: Mr Ariff Chan (Dean, Academic Studies) Mr Kwan Chong Sin (HOD, Mathematics), Ms Koh Khang Ling (HOD, Biology and Physics) and Mrs Wong Seok Hui (ADH, Biology), Mr Jason Tan (ADH, Chemistry). We understand that Further Math was discontinued in 2007. Why has it been reinstated in the new syllabus? 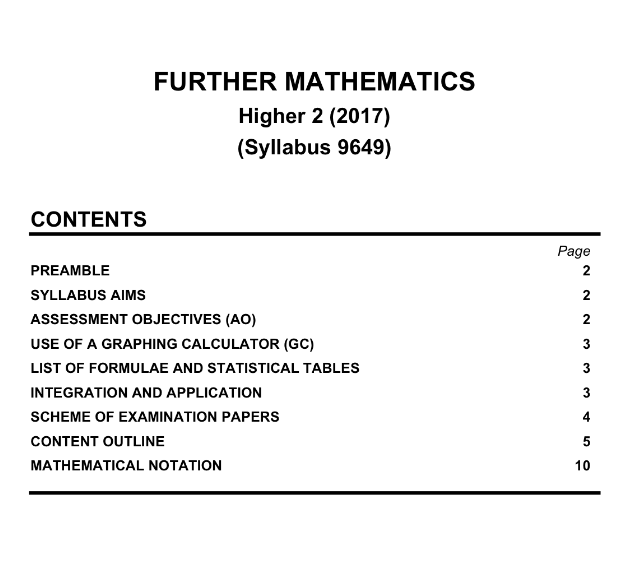 When Further Math was discontinued in 2007, H3 Math was introduced in its place. The take-up rate and interest level, however, were not very high. That may be a possible reason for the reintroduction of Further Mathematics to re-stimulate interest in the subject. Introducing Further Math may also signal Singapore’s increasing emphasis on technology, information management and engineering. Math lays the foundation for all these disciplines. What pre-requisites are needed to take Further Math? For the RP students, a 4.0 for Math 1 and 3.6 for Math 2 is required. JAE students will require an A1 for both E Mathematics and A Math. How does Further Math differ from Normal Math? Actually, our current H2 Math Syllabus is already moving towards the kind of learning you’ll encounter if you take Further Math. Math is inter-topical – a Vectors question can also test knowledge of Coordinate Geometry and trigonometry. There is also an increasing emphasis on the link to real life. New topics (not encountered in H2 Math) such as Linear Spaces, Conics Sections and polar coordinates will also be introduced in Further Math. What benefits are in taking Further Math? Further Math is not a prerequisite for any university course. What it does do however, is give a head start to those students who are deeply interested in math and engineering, and want to pursue a career in these areas. Hence, the standard combination offered including Further Math will be FMPE, which builds on how math and physics are deeply inter-related. Taking Further Math however, is not for anyone aspiring to be a doctor, because taking Further Math means not being able to take double sciences, as contrasting subject is a requirement. This cuts off several university courses among which are Medicine and Chemical Engineering. So only apply for Further Math if you can envision yourself in a math-related career. Further Math is a H2 subject though, so it can contribute to your University Admission Score. Will the teachers employ different teaching methods for Further Math, given the emphasis on application of mathematical concepts? Well, the way we approach the subject may be slightly different, and for the better. Taking Further Math and Math essentially means four lectures and four tutorials of Math per week. That can become very dry if we don’t vary our methods of teaching, so we may include projects and learning experience-based learning for suitable topics in Further Math. What advice do you have for students who want to take Further Math? Get your foundation right, because whatever you learn in Y1–4 is assumed knowledge in Year 5. We won’t for instance spare any time to revise Trigonometry for you, so do remember the sine rule and cosine rule, completing the squares, for instance. Math is also applicable in many other subjects, so it would do you a lot of good to have a strong foundation in it coming into JC. Have there been any major changes in content in the Science Syllabus? The amount of changes in the syllabuses varies amongst the Science subjects. The core ideas behind the subject, however, remains largely the same , and have gone through some re-organisation in the new syllabuses. Notably, two new topics have been introduced for Biology: Infectious Diseases and Climate Change while Lasers and Semiconductors have been removed from the Physics syllabus. The weightage for MCQ has been lowered from 20% to 15%, and the weightage on SPA has increased from 15% to 20%. What do you think is the rationale for the changes? School-based Practical Assessment (SPA) no longer exists in the new syllabus and will be replaced by the end of year practical examination. Previously, SPA was also worth 20% (5% planning question in Paper 2 + 15% practical examination). In the new syllabus, the practical examination includes both the practical component and planning in the same paper, and this will be 20% as well. The number of MCQs have been lowered, accounting for the change in percentage. What advice would you give students who want to prepare for the new syllabus? With a new level of education comes new expectations in terms of marking requirements. In particular, we’d advise students to take a more comprehensive view of their syllabus. Don’t study topics in isolation, because many topics are interlinked. Application occurs across several topics. Whereas you have been trained in SPA in secondary school, in which it is clearly stated what skills you need, the End of Year Practical examination in JC will be more holistic and definitely more intense. Be mentally prepared, and expect the unexpected. The new syllabus also includes an explicit curriculum framework that integrates the practices of science, core ideas, and learning experiences. What difference do you think this will make for your teaching? The new syllabus includes an explicit curriculum framework to emphasize how science and real life are inseparable. Many students see them as very separate things, so we believe the rationale behind the new framework is to make the link between science and daily life more intentional and explicit. Studying Science isn’t just about knowing facts. It is about learning to grasp the fundamental concepts and ideas which will allow students to make sense of any scientific phenomena they come across in the future.